The Cumberland & Dumfriesshire Farmers Mart P.L.C. had forward 71 prime cattle, 2 young bulls, 37 over thirty month cattle, 5,419 prime lambs and 6,156 cast ewes & rams at their weekly sale at Longtown on Thursday 4th August, 2011. Another big show of 71 prime cattle saw keen bidders ensure prices were up on the week. Prices peaked at 213.5p for a Limousin steer from Mr A. Irving, Toppin Castle, purchased by W. Kirkup, Butcher, Longtown. Heifers topped at 211.5p for a Limousin from Messrs J.W. Vevers, High Stenries, purchased by Border Meats Wholesaler Butcher, Lockerbie. Mr Irvings run of cattle levelled at 210.3p, with Mr Vevers cattle averaging 204.5p. Limousin – 213.5p Toppin Castle, 206.5p, 203.5p The Gill, 202.5p Newtown, 194.5p, 191.5p The Gill, 187.5p Fenton, 186.5p Townfoot, 185.5p Fenton. British Blue - 209.5p Toppin Castle, 197.5p The Hagg. Charolais – 204.5p High Stenries, 182.5p Nirvana. Limousin – 211.5p High Stenries, 207.5p Toppin Castle, 198.5p Newby Farm, 197.5p High Stenries, 196.5p Snab Farm, 195.5p, 191.5p Newby Farm, 187.5p Wicket Thorn. Charolais – 202.5p, 192.5p, 187.5p, 181.5p, Wicket Thorn, 181.5p Sceughdyke. Limousin – £1,387 Newtown, £1,363 The Gill, £1,334 Toppin Castle, £1,283, £1,280 The Gill, £1,270 Fenton, £1,254 The Gill. British Blue – £1,288 Toppin Castle. Charolais – £1,216 High Stenries. Charolais – £1,414, £1,245, £1,225, £1,190 Wicket Thorn. Limousin - £1,269, £1,165 High Stenries, £1,153 Wicket Thorn, £1,113 Newtown. A better show of Over Thirty Month cattle saw another firm trade throughout. Limousin cows topped at 143.5p from R.M. & P. Armstrong, Slealands and 138.5p from T.L. Hogg & Son, Ryehills. Limousin – 143.5p Slealands, 138.5p Ryehills, 131.5p Sceughdyke, 127.5p, 120.5p Kildaloig. British Blue – 127.5p Stonehouse. Friesian – 126.5p, 123.5p Broathill. Angus – 125.5p, 124.5p Kildaloig, 119.5p Langholm Farm, 113.5p Kildaloig. Shorthorn – 117.5p, 113.5p Barend. Limousin – £1,156 Ryehills, £904 Slealands. The largest show of the season so far saw 5,419 prime lambs forward to the usual ring of buyers with trade following this weeks national trend and averaging 181p per kilo. Lambs 28-32 kilos averaged 200p, 32-41 kilos averaged 190p, 41-44 kilos averaged 180p, 44 kilos + averaged 170p. Heavy lambs were harder to cash. Outwith the sale a lambs sold to a top of £95.50 per head and 214p per kilo for Texels from Mr Alistair Bell, Kirkton, Messrs Forster, The Nook also sold Suffolks at £95.50. Other Texels to £94.50 Minsca, £92 Fountanbleau,£90 Lynegar; other Suffolks £92 Knells, £87.50 Roughet Hill; Greyface £89.50 The Nook, £84.50 Mosshead, £77.50 Highside; Rouge £88, £82 Middle Farm; Bleu d’Main £83, £80 Middle Farm; Charollais £85.80 Nunscleugh, £84.80 Southburn; Zwartbles £80 Viewfields; Hill Cheviot £75.50 Tushielaw; Half Bred £72.80 Earlside; Cheviot Mule £71.80 Terrona, £69.80 Tushielaw; Leicester £74.50 Nunscleugh, £71.50 Tinnis; Blackface £73.50 Tinnis, £64.50 Penpeugh; North Country Cheviot £72.80 Earlside; Swaledale £72.50 Roachburn; Oxford £69.80 Guards; Vendeen £69.80 Milton Mains; Lleyn £65.50 Craighousesteads. Another massive show of 6,156 cast ewes and rams was forward to the usual full ring of buyers. 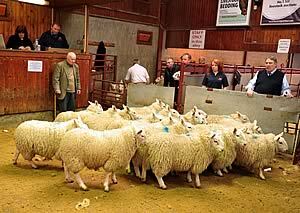 The sale was topped at £178.50 for Suffolk rams from Fountanbleau, others £123.50 Newbigging; Texel £163.50 Kingfisher Park, £153.50 Burn House and The Reddings; Leicester £144.50, £134.50 Kilnstown; Charollais £123.50 Lirrit; Hill Cheviot £113.50 Elsdonburn, £106.50 Naddle; Blackface £98.50 Shitlington Hall, £94.50 Clonrae; Swaledale £80.50 Stackbraes, £68.50 Burn House and Wolfhills; Beltex £68.50 Newton Cottage. Heavy ewes sold to £140.50 for Texels from Carran and Kingfisher Park, £138.50 Oldfield, £136.50 East Middle and Fountanbleau; Suffolk £129.50 Mossilee, £128.50 Lynegar, £126.50 Fountanbleau; Half Bred £120.50 Fountanbleau; Charollais £118.50 Roadside, £114.50 Severs; Leicester £114.50 Roachburn, £113.50 Kilnstown, £110.50 Nunscleugh; North Country Cheviot £106.50, £100.50 Lirrit, £100.50 Roadside, £98.50 Haithwaite and Severs; Cheviot Mule £106.50 Clackmae, £104.50 Colmslie Hill, £96.50 Stobo; Greyface £104.50 West Wharmley, £96.50 Glencartholm, Bartondale, Lintlaw, Sceughdyke, £95.50 Mossilee; Beltex £98.50 Fountanbleau, £96.50 Roadside; Zwartbles £86.50 Viewfields. Hill ewes to £102.50 for Lleyns from Sharplaw; Cheviot £88.50 Oldfield, £84.50 Murtholm, £82.50 Winterhope; Blackface £84.50 The Nook, £82.50 Slaterfield, £80.50 Balliemore; Swaledale £78.50 Midtodhills and Nunscleugh, £69.50 Roachburn, £67.50 Kilnstown; Herdwick £58.50 The Bank Farm and The Bents, £55.50 Haithwaite; Jacob £54.50 Beyond the Moss; Shetland £36.50 The Bank Farm. Goats to £78.50 Common House, £73.50 Lamb Hill Terrace, £70.50 Loud Farm.